The V-Range includes all chillers with scroll and reciprocating compressors, whose main feature is the guarantee of reliability and durability, with consequent advantages in terms of cut in management and maintenance costs. These chiller are characterized by compact size and light weight, and, therefore, turn out to be particularly suitable for small plants. 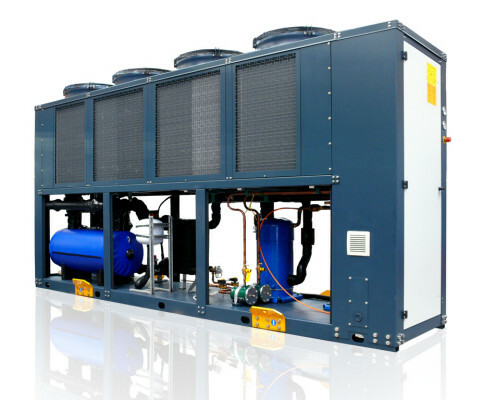 In addition to that, the few vibrations and the very low noise levels ensure that these chillers are used in industrial but also in civilian applications (comfort cooling). The great innovation introduced by Geoclima, especially as far as scroll compressors with R410A are concerned – but some applications have been studied also for reciprocating compressors with R290 – consists in the possibility to combine several compressors in a single unit. Indeed, if this kind of chiller usually has a very reduced capacity (from 3 to 50 kW), the redundancy enables the development of machine with higher capacity, even of hundreds kW. In thereby, the V-Range units are no more restricted to small-size applications but, on the contrary, can also be used for bigger plants. The Energymiser equipment offers chillers with scroll compressors and R410A, a refrigerant that came into use to replace the R22. This refrigerant has been used for more than a decade: such experience ensures not only a deep knowledge of its qualities and wide range of use, but also great reliability and efficiency. Moreover, compared with other refrigerants, R410A provides higher energy efficiency and lower energy consumption. 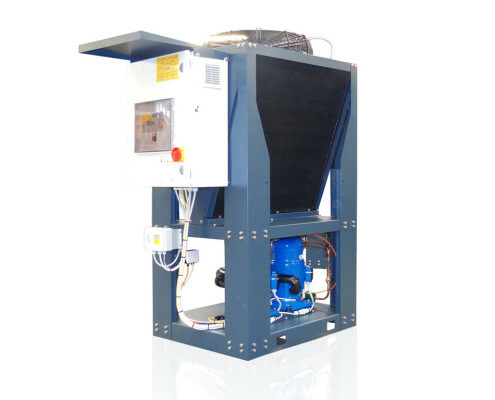 The V-Range Energymiser chillers are small and compact. They are characterized by low vibration and low noise levels: these features, together with the reduced management costs, make these chillers particularly suitable for “comfort cooling” applications. On the other hand, the Greenmiser line is characterized by the use of refrigerants with a very low Global Warming Potential (GWP): HFO-1234ze with GWP<1 and R290 – a completely natural gas – with GWP=3. One of the leading values of Geoclima is represented by the attention to sensitive issues such as eco-sustainability and environmental protection, and from this perspective new solutions have been studied to integrate the high reliability ensured by reciprocating compressors and the innovative use of low GWP refrigerants, such as R290 and HFO1234ze. Although this kind of applications has only recently been developed, Geoclima has gained valuable experience – especially through the development of the first World HFO chiller – and can offer high efficiency and reliability. The V-Range Greenmiser chillers are designed to provide a real combination of performance and eco-sustainability of the entire application and to ensure high security and reliability in the use of HFO1234ze and, mainly, of propane.